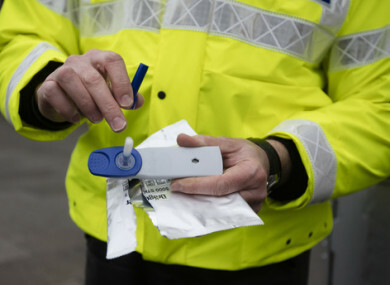 GARDAÍ ARE SETTING up Mandatory Intoxicant Testing (MIT) checkpoints nationwide over the Easter break. The MIT checkpoints which will test drivers for the presence of alcohol and drugs. A total of 59 people have been killed or seriously injured in Easter Bank Holiday crashes since 2012, according to figures released by the Road Safety Authority (RSA) and An Garda Síochána. “Members of the Garda Roads Policing Unit will be conducting roadside screening at MIT checkpoints right around the country, for both alcohol and drugs. In addition to this we will be watching out for the erratic behaviour of drivers as a means of identifying those who may be driving under the influence of an intoxicant. He added that gardaí “will also be targeting other killer behaviours such as speeding, mobile phone use and non-wearing of seatbelts”. An RSA report in 2014 found that one third (33%) of drivers/motorcyclists that died had alcohol in their system at the time of their deaths. The examination, which was conducted by the Health Research Board (HRB) as part of the National Drug Related Death Index (NDRDI), also found that 28% of pedestrians killed had a positive toxicology for alcohol. Nobody ever thinks that something bad like being in a crash will ever happen to them, but it can. Email “Garda checkpoints for drink and drugs to be set up nationwide over Easter weekend”. Feedback on “Garda checkpoints for drink and drugs to be set up nationwide over Easter weekend”.